So like me you own a Apple laptop and an iPad or iPhone (or both) but now you have all those charging devices that all take up space and power sockets. The people from Twelve South made a perfect solution for that and it’s called the PlugBug. The PlugBug is an USB adapter that fits right on to the power adapter Apple supplied with your Mac laptop. Just take the power plug of and slide the PlugBug on and you are set. 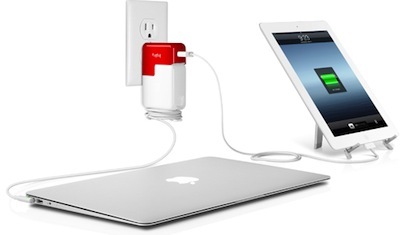 The Plug Bug is red and makes you adapter look more fun and now besides being still able to charge you Mac you now also have 10 watt USB port that can be used to charge an iPad (even the new iPad). And now you only need one power socket and it is pretty compact. And if you would like you could also just use the PlugBug as a stand alone USB charger. Make charging your devices easier by using the Twelve South Plug Bug.